India's ONLY International Tattoo Festival is the ultimate 3 day devotion to "INK ART" featuring a stellar lineup of some International & Indian Tattoo Artists - Paul Booth, Stepan Negur, Meehow katarski, Jamie Mahood, Sameer Patange, Lokesh verma, Alex shimray, Deep kundu and Sunny bhanushali to name a few. 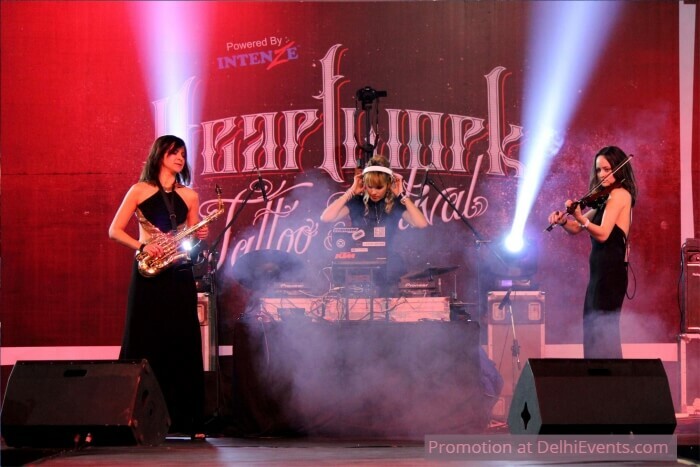 Bringing in a new kind of celebration to the free spirited Nation, the pioneers of the Indian tattoo industry - Indian Tattoo Gurus- Lokesh Verma & Sameer Patange with top notch tattoo equipment suppliers – Arvind Garg of Tattoo Gizmo are all set to take India by storm yet again after a roaring successful three year run with its 4th edition of the Heartwork Tattoo Festival. Conceptualized and created with a vision to embrace the Eternal Tattoo Art and integrate India’s dexterity into Global Trends, this colossal 3 day "INK ART" event is all about celebrating ones individuality and embellishing one’s soul with one-of-a-kind experience. A perfect platform to showcase talent from across the globe. International Convention | Body Art Workshops | Tattoo Contest | Live Music & After Parties. International Convention featuring over 100 Indian and 60 International artists participating and showcasing their work “live”. Aspirants can make an advance appointment to get themselves inked by their artist of choice. Body Art Workshops: Live workshops by legends of the international tattoo industry. They take upcoming artists through live demonstrations on various art practices and design methods. A not to be missed opportunity for enthusiasts to learn. Tattoo Contest: A 'live tattoo on-the-spot' Competition is held across 3 days of the Festival with multiple categories to compete in. Every day the best selected tattoos are awarded trophies & prizes by our sponsors. Live Music & After Parties: Live music bands & DJs performing in the evenings at the Festival is a major highlight. Each day, featured performing artists create a fun vibe for the audience and bring an additional zing with their high energy acts. Mr. Andre Tully, partner Heartwork tattoo festival says, “We are very pleased to announce the 4th edition of India’s Only International Tattoo Festival. After a successful three year run, this year we are very excited to bring about not only a stellar line-up of globally recognized and upcoming talented artists and legends on board during our three day event but we also have a host of interesting experiences as well. Keeping in mind our vision to embrace the eternal tattoo art and integrate India’s dexterity into global trends, we aim to create its own niche in the cultural fabric of our society. It is great to have the support and solidarity of the Indian tattoo industry, the artists and we look forward to a wonderful celebration of "INK ART".